For fans of the series, more Call of Duty is always going to be welcome, and where the quality shines here it is easy to see why. The campaign is exciting throughout, and the multiplayer fast and satisfying. However the new co-op mode is weak, and there is little here likely to attract new fans to the series. The Call of Duty franchise has now become an annual event, with this year’s title Call of Duty: Advanced Warfare being recently released. Games Fiends is locked and loaded for a look. Looking at the Call of Duty series as a whole is a form of time travel: the early titles were set firmly in the past, with World War 2 as a setting; then there was a move towards the present with Modern Warfare, and Black Ops 2 and Ghosts took us a short step into the future. 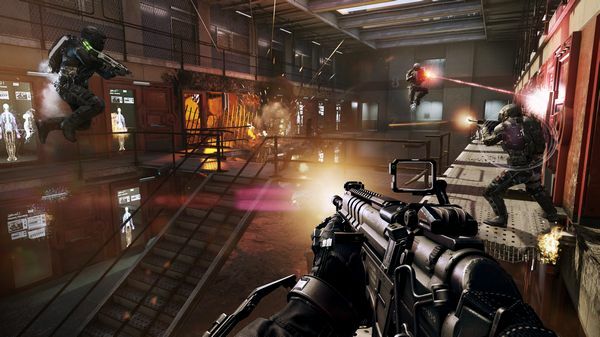 Advanced Warfare takes us a step further, being firmly set in the mid 21st century, and allowing developer Sledgehammer Games [and High Moon Studios, who did the PS3 and 360 versions] a degree of freedom in the world and technology they build. The campaign opens with main character Private Jack Mitchell being involved in a defensive battle for Seoul in South Korea as North Korea invades. 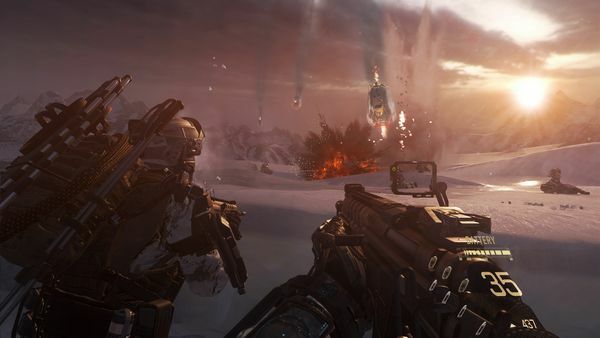 This leads to a run through what is already one of the most high-tech cities in the world, here now filled with swarms of attack drones, walking tanks, guns offering holographic readouts (there is no HUD in the game for a change), and soldiers wearing the most significant piece of technology in the game – the Exo suit. This frame gives the wearer access to additional abilities, ranging from movement with double jumps or wall climbing, to defensive shields and offensive sonar blasts. These abilities tend to vary level by level as situations require, but several also appear giving new variations to the multiplayer and co-op modes (which we will get to shortly). Mitchell is injured in the fighting though, resulting in his discharge from the army but leading to a job offer from Jonathan Irons, the head of private military organisation Atlas Corporation and played by none other than Kevin Spacey. There follows several missions pursuing a group of anti-Western and anti-technology terrorists, the NVA, across several continents – although it goes without saying that this pursuit is not straightforward and leads to a couple of plot twists (which in fairness probably won’t be much of a surprise). This is Call of Duty as we will all recognise it. It follows the recognised formula of moving from set piece to set piece with AI teammates calling out objectives; but these set pieces are as ever pretty ballsy, with you finding yourself engaging in running battles through nuclear reactors, jumping across the rooves of moving coaches in a high-speed freeway chase, or bringing down a cargo plane over Antarctica. The explosions come regularly, the number of enemy soldiers to shoot through it unfeasable, and it works. If there is one thing the CoD franchise does well, it is make you feel like the centre of an action movie. It may not be subtle, it may not stand up to scrutiny, but it feels exciting. This is not to say that there aren’t some new things added, with varying results. One level starts with a stealth section, introducing a detection mechanic and silent kills, but is not seen after this one use – it is kept short and sweet. Another level has you at the controls of a jet fighter, which should be exhilarating but doesn’t really stand up on its own merits. It’s also short though, again is not used afterwards but is not missed. For me, the highlight of the variations introduced via the narrative was a level where, due to Mitchell’s injury he is unable to reload any weapons. In terms of game mechanics, this means that every gun has a single magazine, and when empty must be discarded for replacements from enemies. At times like this you realise how easy it is to drop back and reload, and the pressure of making every bullet count adds a degree of tension to the fights… even if death only drops you back to the previous checkpoint. Visually, the game is impressive. The character models especially are near-photo realistic, with faces close-on to looking filmed instead of rendered. There are some moments where things drop into the uncanny valley, and others where postures or points of contact with objects bring you back to realising it is the game posing models, but ultimately it looks probably as good as a title will on the now-old generation of consoles. It also means that more attention can be paid to the characters in the story – we see a lot of Irons in cut-scenes between levels, with Spacey putting in a strong performance as a focused businessman whose business is combat. Yes, there are moments where you mentally detach from things and go “… that’s Kevin Spacey in the game!”, but this is not any fault of either Spacey or Sledgehammer, more the advance of technology and gaming that major actors can actually “star” in a game, not just provide a voice. One day, this may be normal; for now, it stands out. Of course, the campaign is only one of three modes. PvP multiplayer has always been one of the most successful parts of the series, and all it takes is setting foot into a team deathmatch for a quick reminder of why it is so fun. The pace is as fast as ever, with twitch reflexes often being the most valuable in an encounter. Players can customise their loadouts, which in keeping with the series provide new options as ranks are gained. 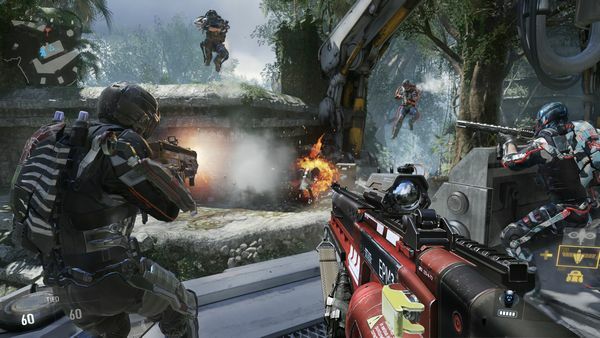 New weapons unlock, and attachments for them are gained as you use them; perks can be added to adjust important abilities; scorestreaks are selected; and the abilities of your Exo can be changed. 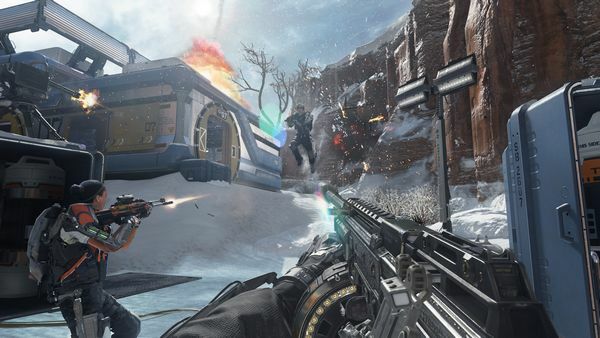 The PvP carries much of the same flow as earlier titles – there are good reasons that the Modern Warfare and Black Ops titles are still popular. The significant change here is the addition of your Exo, with the new levels of movement – especially vertical movement – opening up new approaches to try and take down the opposing team. CoD multiplayer has always been more welcoming of lone wolf players than rivals such as Battlefield; this still feels true here, with maps quickly becoming a varying series of individual battles that merge together. It’s something that shouldn’t sound like it works, yet does, and the only drawback is the harsh learning curve for new players looking to upgrade to better equipment against more experienced players who already have it. But of course equipment is only something to support ability, and even a rank 1 player with default gear should feel able to participate. The final mode is a multiplayer co-op mode, and… well, here’s probably where the game falls down most prominently. The idea is solid – up to four players in enclosed maps, fighting of waves of attackers and every few waves having to complete other objectives, such as disabling bombs or collecting dog tags. However, in practice it feels somewhat lukewarm, a grind against generic enemies without any of the bombastic feel of the single player campaign or progression of the multiplayer. It’s not bad exactly, just underwhelming. It can make a fun diversion for playing with friends, but not much more than that. Short of the inevitable DLC adding something spectacular to this mode, it is hard to imagine it making the same impression as Spec Ops in Modern Warfare 2 or Zombies in Black Ops. For fans of the series, more Call of Duty is always going to be welcome, and where the quality shines here it is easy to see why. The campaign – with the exception of a couple of disappointing sections – maintains a level of excitement throughout, and the multiplayer remains fast and satisfying. The new co-op mode is the weak spot, feeling lukewarm in comparison, and overall there is little here likely to attract new fans to the series. But for the loyal, this is a very welcome addition to the series with some interesting new ideas.